Figuration co-Founder Leo Crane explores the intimate collaboration between portrait painter and sitter. When we look in a mirror, we see a version of ourselves. We’re checking our hair, hoping we don’t look too tired or seeing if this scarf goes with that jacket. More often than not, it is a superficial glance to confirm what we want to show the world – and what we want to hide. This is even more evident in the hyperconnected world of the snapshot or selfie, a briefly considered image that confirms only the character of our social media profile. Too rarely do we take the time to pause, be still and allow this façade to dissolve. When you sit for a portrait, the moment expands over several hours and allows a richer, deeper sense of self to emerge. The thought of doing this under the gaze of another can be intimidating, especially when that person is a stranger set on capturing your inner self in a painting for everyone to see. However, it’s hard to find another experience where your every feature is valid: the colours of your skin glow on the painter’s palette, every bump, shadow, curve is celebrated as an essential part of the creative process. You are the stimulus that propels brush to canvas in an ongoing dialogue between painter and sitter. 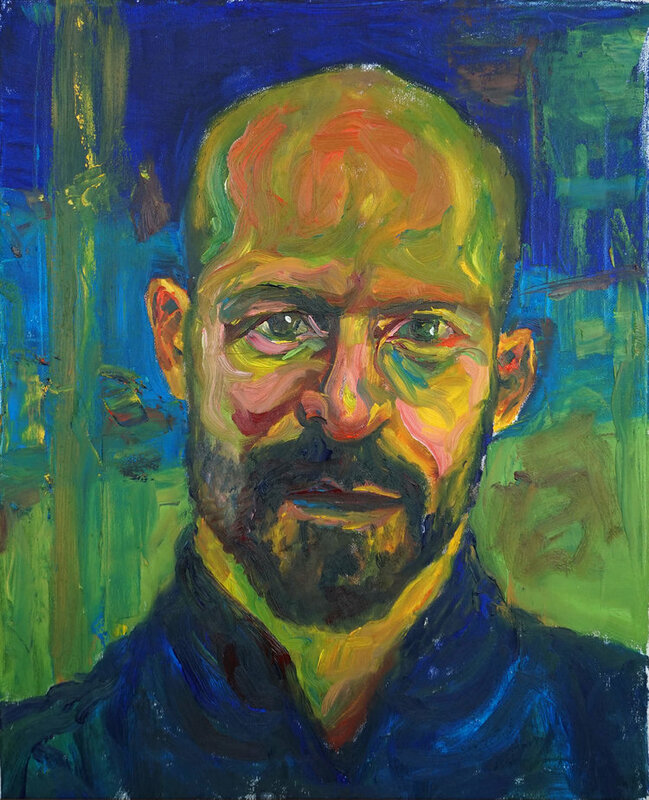 It is this creative connection that draws me to portrait painting. Even if I’ve never met the sitter before, we quickly establish a mutual trust. For my part, that means seeing you as a unique individual, someone who is present in my studio at that moment, living and breathing – not a two-dimensional copy of a photo from a time and place I do not know. Dialogue is therefore essential. Often this includes chatting over several cups of tea, but sometimes it is a silent understanding in which we are connected by an intimate sharing of space and time. I start by drawing vigorously in charcoal for about 15 minutes. This gives me time to get to know you, to make the connection between you, my eyes, my arm, my hand, the charcoal and the paper. It also gives you time to settle into the experience and find comfort in your pose. When we’re both ready, I put the drawing aside, take out a canvas and choose my oil paints. I start with darks, exaggerating colours to find contrasts. I don’t draw on the canvas but get as much paint down as quickly as possible. In this way, the colours can find their hue in relation to each other and the drawing emerges where they meet. I encourage regular breaks to keep you comfortable and to allow me to step away from the painting and see it with fresh eyes. When I’m happy with the darks, I bring out some brighter mid-tones, and finally the lightest colours. I progress from painting knives and large brushes to finer brushes, fingers and rags. Details begin to emerge, and I refine the likeness as I go along. I always engage the sitter with the process, encouraging feedback as the painting develops. After about three hours, we have created a painting that holds the life you have given it. Any more and we risk erasing that vitality, not to mention muddying the paint that lies thick and wet on the canvas. The sitting is done, and the canvas stays on the easel to dry. I come and visit it the next day and perhaps make a few minor adjustments (usually minor shifts in the wet paint with my finger or brush). In a couple of weeks, it’s dry, ready for you to enjoy as enduring evidence of our creative collaboration. A portrait experience with Leo Crane at the Figuration studio, Crystal Palace, starts at £400. For more information visit www.leocrane.co.uk/portraits.